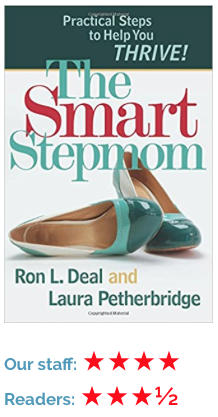 Authors Ron L. Deal and Laura Petherbridge are two well-known authors on step parenting topics, Deal with his many "Smart" titles and Petherbridge with her 101 Tips for the Smart Stepmom. This book brings out the best in both authors. I also found it welcome that the ever-present Christian theme of books published by Bethany House (who publish both authors) is toned down as compared to some of Ron L. Deal's other titles, so that it did not overpower the information on step parenting. The heavy Christian tone of his other books was a turn-off for some other readers (although just as many likely found them perfect for just that reason). Here, each chapter ends with a prayer and some Biblical references, but most of the content is focused on the issue of being a stepmom. So this just right for the Christian reader who will find that information beneficial, and easy to skip over if they are not interested in a religious perspective. Some of the chapter titles let you know right away you are in for a good step parenting book: "Can I run away from home?" "The Wicked Stepmother: Did Disney Have Me in Mind?" and "Meet Your Ex-Wife-in-Law: Friend or Foe." Also pleasing is the format of the book, nicely broken up with shaded text boxes, frequent headings, quotes and bullet pointed sections. When reading several hundred pages, this is important. But on to the subject matter . . .
Chapter Two, "Can I Run Away from Home?" is one of the book's best, as it does an excellent job of helping the reader with the many difficult emotions of the stepmom, feeling like the "outsider" in the house. As one mom is quoted, "I traveled to a foreign country many years ago, and my own home now reminds me of the isolation I felt there." Another said, "I hate my house when his kids come over. I have to shift into survival mode." Sad quotes, but sadly true for so many step moms. In combating this, the authors give many suggestions: make your time with the kids' dad feel less intrusive by encouraging more time alone between dad and kids; don't deny yourself friends - quality time with others is important; start new traditions while at the same time give your step kids "permission" to have a past that doesn't include you; manage your own emotions and fears so that you don't respond with the same negative emotions being thrown at you; "resign" from some step parenting conflicts and leave them to your husband. One major flaw I find in so many step parenting books is that they are written exclusively for stepmothers. Just look at the titles out there. Very, very few are directed at stepfathers. This is tragic as it is often stepdad who could use the most guidance, but let's face it - men simply don't read as many books as women, particularly on a subject like parenting. That's one thing we loved about Step Parenting: 50 One-Minute DOs & DON'Ts for Stepdads & Stepmoms, and how many of its suggestions we felt empowered women (and therefore daughters too for when they grow up). It equally addressed issues for stepmom and stepdads. 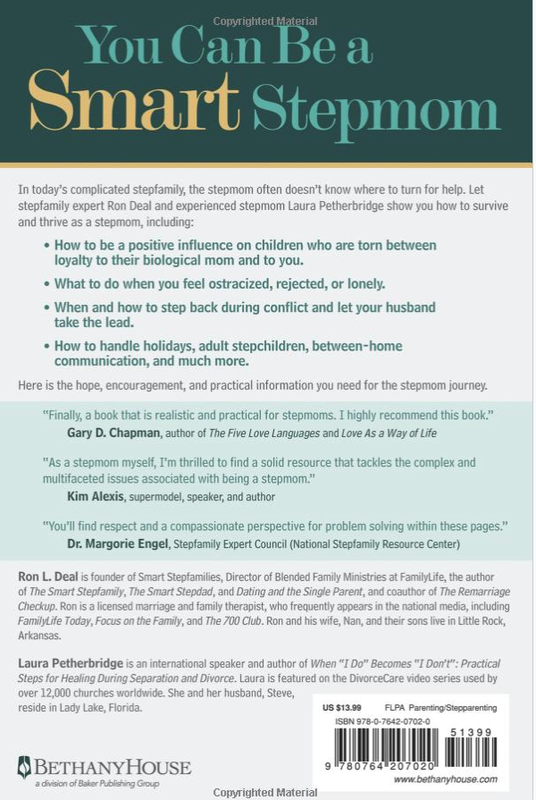 So we were thrilled to see two chapters in The Smart Stepmom that were directed specifically to stepfathers. The first one is "She Can't Do It Without You," and the second was "Pitfalls and Good Intentions." Some of the themes in these chapters are: declaring loyalty to your wife; trusting your wife's heart; be an engaged father with your kids; don't cower to your ex-wife; don't allow disrespect, to name but a few. Maybe because I was so pleased to see the inclusion of these chapters, they were my favorites in the book. There was also a helpful chapter on adult stepchildren. Just because a stepfamily is formed when the children of each spouse are adults does not mean there will not be conflicts and resentments. Some are the same as when the children were young, and some are unique to them having an adult mindset. If there was a negative comment among some readers it was that some excellent step parenting topics were identified, but were not always solved with actual suggestions. Overall, however, Ron L. Deal and Laura Petherbridge have delivered a very good book.